Dancing with the Stars is returning to television but actors Annie Whittle and Russell Dixon already have an insight into what the people signing up for the show may be waltzing into. Whittle and Dixon are rehearsing for North Shore-based Tadpole Productions’ first show of the year, Six Dances in Six Weeks. Written by American Richard Alfieri, the play uses dance lessons – the swing, tango, waltz, foxtrot, cha-cha and a contemporary number – to bring together its two protagonists. It has been performed in 24 countries, translated into 14 languages and made into a film starring Gena Rowlands. In the stage version, Dixon plays former Broadway performer-turned dance instructor Michael Minetti, as quick with acerbic one-liners and wry observations as he is on his feet; Whittle is retired teacher Lily Harrison, who’s always wanted to learn how to dance and is paying Minetti for private lessons. Each segment of the show ends with one of the dances and director Janice Finn says there may be a correlation between each dance and the drama and comedy which unfolds on stage. Finn describesSix Dances in Six Weeks as a touching play that encompasses a wide range of themes. It means both actors, especially Dixon, must show off snippets of fancy footwork. With choreographer and ballroom dancing champion Amber Dixon, Russell’s wife, they have been having intensive dance rehearsals. While both have done dance training, they say ballroom dancing is not as easy as the experts make it appear. Having starred in a number of West End and touring productions during a seven-year stint in Britain, since returning to New Zealand last year Dixon has taken lead roles in local musicals Hairspray andMamma Mia. He says ballroom dancing aside, probably the greatest challenge has been finding the right rhythm for a show starring just two actors. Having recently appeared in Auckland Theatre Company’s comedy The Ladykillers, Whittle says that show was a fantastic prelude to Six Dances in Six Weeks. She took last year off to care for her mother and says she’s not sure she’d have been “match fit” for the two-hander without something slightly less physical first. Whittle chuckles when asked if Lily Harrison is as formidable as some of the women she has played lately, including the titular character in Driving Miss Daisy. She says there are few similarities “and she’s certainly not like Mrs Wilbourforce from The Ladykillers“, except that they are complex and provide Whittle with some of her career’s best roles. Annie Whittle dons her dancing shoes! 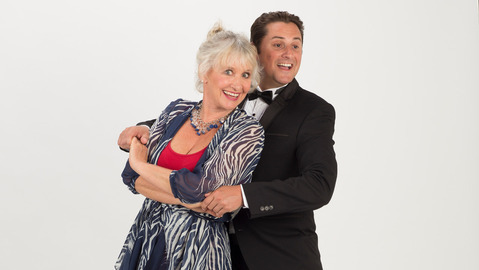 Local theatre company Tadpole Productions’ current production, the comedy-drama Six Dance Lessons in Six Weeks features one of New Zealand’s most beloved veteran actresses – Annie Whittle. Annie has featured in a couple of past productions at The PumpHouse and always proves to be a crowd-pleaser. This play places her in the role of a lonely retired widow who hires a former Broadway dancer to come to her home and teach her to dance over six sessions. Well-known North Shore musical theatre identity Russell Dixon plays the role of dance instructor. Initially the two characters dislike each other, the conservative senior and the flamboyant middle-aged gay man whose days on stage are well behind him find little common ground. The play’s humour is generated by the characters’ fractious relationship but as they get to know each other and share their deepest secrets, a bond is established which brings much pathos to the narrative. Six Dance Lessons in Six Weeks debuted on Broadway in 2001 but its theme is still relevant today in our ageing society which values youth and beauty. Through the developing relationship of the two characters, the play gently delves into the topical issues of ageism and intolerance. But the real pathos is located firmly in reality as during the pre-production phase of this season of Six Dance Lessons in Six Weeks, Tadpole Productions much loved founder and producer John Antony passed away after a brief illness. This season is therefore a poignant one for the actors and director. No doubt they will bring something special to the stage in his memory. Tadpole Productions have chosen the internationally acclaimed comedy Six Dance lessons in Six Weeks by Richard Alfieri as their first show this year, directed by Janice Finn. Annie Whittle (the wonderful Miss Daisy in Tadpole’s sell out season of Driving Miss Daisy) and Russell Dixon (a sensation in last year’s musicalHairspray at Sky City Theatre) star in this gem of a play that has been performed in 24 countries and translated into 14 languages. A formidable, lonely, retired lady hires an acerbic, quick tempered dance instructor to give her private ballroom dancing lessons – one per week for six weeks. This touching human comedy bridges the gulf between different backgrounds and perceptions, as two strong willed characters of different ages battle their way through the lessons and a surprising bond develops, secrets are revealed and lives are changed, celebrating the essence of true friendship. Annie Whittle has been a favourite of New Zealand audiences for her roles in TV, film and theatre over many years. From Shortland Street to starring opposite Sir Anthony Hopkins in The World’s Fastest Indian she is an iconic actress with an exceptional talent for creating believable characters. Russell Dixon has had a career in musical theatre in New Zealand and on the West End in London , combining lead roles with television work, film and touring productions – Blood Brothers, Top Hat, Mama Mia, Miss Saigon and Hairspray amongst his successes. Director Janice Finn is no stranger to either side of the footlights, beginning her career as an actress in New Zealand and Australia, then moving to television directing and producing – with the classic soap Gloss her first foray into producing. She has directed plays throughout New Zealand, including two premieres of Roger Hall plays for Auckland Theatre Company.